What can I send to Tunisia? What items are restricted? Maximum weight per item cannot exceed 30kgs. Should any items exceed 30kgs, they will be returned to the collection address. Consignee will need to be present at Tunis customs office to present their passport and clear items. Send My Bag can send your luggage to your hotel in Tunisia, so that it is waiting for you on arrival. This means that you do not have to drag it on to public transport. This also means that you can sail through the airport without having to wait in line at bag drop or wait around at luggage carousels. If you are studying or doing research in Tunisia, Send My Bag can send to your student accommodation all the possessions you will need for your stay. By shipping your things you can bring so much more with you than you could check into the hold of your plane. No matter if you are moving to Tunisia for good or just visiting, you can send your luggage and boxes with Send My Bag. This means you can have an extra pleasant journey to Tunisia, knowing that your luggage is being looked after for you. You can pack everything you need to make you feel at home in Tunisia, while avoiding the hassle of pulling heavy bags behind you through airports and onto buses and trains. Instead, your baggage can be waiting for you at your hotel. To learn more about sending luggage to Tunisia, visit our ‘How it works’ page, or our ‘FAQs’. Tunisia makes a good golf holiday destination. The most recommended golf courses include Citrus Golf Course, Djerba Golf Club and El Kantaoui Golf Course. You can use your very own golf clubs when sampling these courses by shipping them to Tunisia with Send My Bag. You will appreciate being able to use equipment that is familiar to you, and you can avoid having to wait around at bag drop or luggage carousels, or having to drag large golf bags behind you. See our additional information on how to send golf clubs with Send My Bag, including how to best package your golf clubs. If you are a cycling fan, there are plenty of worthwhile cycling routes in Tunisia, such as the salt flats of Chot El Jerid or the Star Wars set at Ong Ejamel. You can easily send your bike to Tunisia with Send My Bag so you don’t have to cram it into the back of a taxi or onto a bus. Instead, it will be waiting for you at your accommodation, ready for you to head out on your adventure. Your bike needs to be taken apart and safely packaged up before being sent to Tunisia. Check out our information on bike shipping to learn more. If you are moving house to Tunisia you will have to look into international removals to Tunisia in order to move all of your possessions too. Ensure that you choose a reputable removal company that you have researched well and that you package up all your items carefully so that they arrive in one piece. Use suitable packaging for your items and tape everything up appropriately. Tunisia lots plenty of higher education institutions, especially in Tunis, such as the Polytechnique internationale and the Université de Tunis. If you have chosen to study at one of these institutions, or any others, Send My Bag can ship your belongings to your student accommodation, thus lightening your load as make the move to Tunisia. Send My Bag can send all sorts to Tunisia, such as books, writing materials and clothes. Find out more about student shipping on our student page and find out how to receive your student discount. As well as luggage, you can also send a parcel to Tunisia with Send My Bag. Many people choose this option to send gifts or care packages to people abroad, or if those people have left something behind at home. When sending a parcel to Tunisia make sure you pick a sturdy box and seal it up well so nothing gets damaged in transit. Click here to learn more about sending a parcel and find out what you can send with Send My Bag and how to package your items. If you have large bulky items ? like a bedside table or a chest of drawers ? that you need to send to Tunisia, could pay to send them by air freight. This fast service usually takes one to two days. You will be responsible for getting your items from the airport to your final destination, though, and you will likely need to hire a customs agent to handle customs clearance for you. If you send internationally by air freight to Tunisia your items will likely arrive at a major international airport in Tunisia, such as Tunis-Carthage Airport. Sea freight shipping to Tunisia is a much slower option for shipping your items than air freight, taking a number of weeks, but it is typically cheaper. However, you will still need to pay for the services of a customs agent and will need to arrange transport for your items to and from the ports. When using container shipping to Tunisia, your items will most likely arrive by ship at one of the major sea ports, such as Tunis or Sfax. Tunisia’s capital city, Tunis, is full of attractions for travellers to visit. The Bardo Museum, for instance, has hundreds of beautiful mosaics on show. Head to the Medina, where you can purchase all sorts of items, including souvenirs. Or why not visit a traditional Berber village in the mountains? 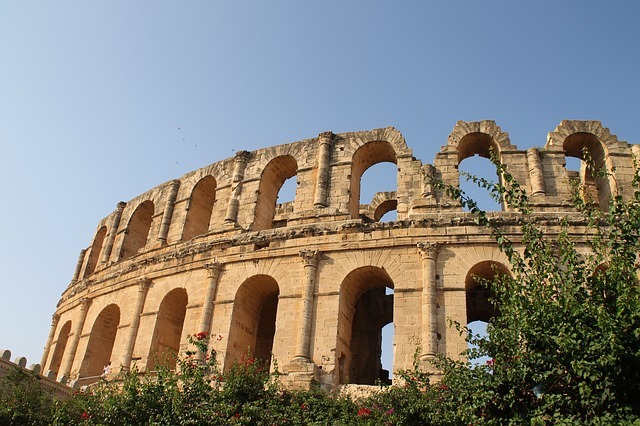 Apparently even better than the colosseum in Rome is the amphitheatre in the town of El-Jem, which has been designated a UNESCO World Heritage Site. There is also the El-Jem Museum in this town, which has hundreds of mosaics for you to marvel at. When you have visited all the sights there are to see, you can retire to one of many Tunisian beach resorts that touch the Mediterranean Sea. Some of the most popular resorts include Hammamet, Port El Kantaoui, Skanes and Sousse.